By 2020, nearly 50 million American women will be in menopause. 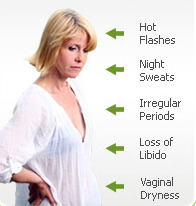 Natural menopause is intended to be a gradual reduction of estrogen by the ovaries with few side effects. In a well-nourished, vibrant woman, the adrenals and other glands pick up the job of estrogen secretion to keep her active after menopause. While almost 90% of women experience some normal menopausal body changes and hormonal fluctuations, most only last a year or two and are not severe enough to interrupt their lives. Did you know that your adrenal gland health is a key to surviving the menopausal transition? Depleted adrenals cannot help a woman achieve her new hormone balance after menopause. A natural adrenal support program can often minimize symptoms and help a woman feel more energized and help support disruptive symptoms like hot flashes. ESTRO G Balance (formerly EST-Aid) - Use at the onset of menopause to help minimize occasional discomfort. Easy Change - Use pre and post menopause for long term balance. Safe, gentle herbal support. Female Harmony - Use during the reproductive years to support hormone harmony and ease occasional discomforts. Plant hormones are remarkably similar to human hormones. They can be accepted by hormone receptor sites in our bodies, and, at only ¹⁄₄₀₀ to ¹⁄₁₀₀₀ the strength of human hormones, they are extremely gentle and safe, exerting a tonic effect. Although used for centuries by both men and women, we are just beginning to understand their power. Studies on soy foods and herbs like ginseng, black cohosh and wild yam clearly show hormone-normalizing effects. They can help ease menopausal symptoms. Yet, they also do not appear to abnormally raise estrogen levels over the long term. Research shows many plant estrogens, such as those from soybeans, can actually increase estrogen excretion in the urine.